Career milestones. They shape us, define us, and test us. Career milestones can be good – like getting that promotion you have been aiming for – or bad – like messing up an interview, saying the wrong thing at the wrong time, or sitting idly by while an opportunity passes you by. Some milestones stick with us and remind us to never make the same mistake twice. Others take us back to a time in life when we felt on top of the world, and are reminded that we can be great again. In this episode we share our biggest milestones, as well as how to mark and learn from then. We also mark our fifth anniversary with a bit of reminiscing. First we all share our biggest milestones. Ross talks about a notable speaking opportunity where he got to share the stage with people he admired. Julia can’t pinpoint a moment, but says she felt she had truly made it when young professionals started seeking her out for advice, rather than always being the young pro asking for advice. Even though Clare is still in the early days of her career, she was proud of her first byline for a story she wrote and produced. And Kristine felt honoured and recognized when she got her first ever promotion in her career. Career milestones affirm and remind us that we can do this, we are capable and worthy of the role we have been given in a company. You may not think you have hit a milestone yet, but we all have. Take a moment to look back on your career, however short it is, or even if it hasn’t started, and reflect on those moments that reminded you that you can do this. Ross has a pretty hefty career bucket list, which gives him a reason to wake up every morning and strive to accomplish new things. But don’t forget, a bucket list is a bucket list. You may or may not accomplish everything on that list, but it is important to have goals that you continually strive for – even if you can’t check something off, you will have at least experienced and learned something new. Fail: if you don’t fail you are not taking enough risks. You need to fail to learn. Make your first big purchase: working hard enough to reward yourself, be it a new business outfit, a new watch or a leather purse. Be picky with choosing a job: experience a moment where you are forced to sit down and asses a new job opportunity – not just picking a job because it is a job, but spending the time assessing whether or not a new opportunity will build on your career. We did a bit of reminiscing of some of our favourite episodes. Shout out to Sarah Bustard, our first guest host in the pilot of Young PR Pros. Listen to this episode now. Ross’ first official episode as a new co-host for Young PR Pros. Listen to this episode now. Our most controversial topic: handshakes. Listen to this episode now. These episodes are the most listened to episodes of all time, since 2012. Click below to listen to any of these episodes and let us know what you think. Episode #116: Concrete Steps to Help Learn from your Mistakes. Episode #74: Fake Facebook and Twitter Followers, a Multi-Million Dollar Business. Episode #101: The Best PR and Communications Campaigns. Episode #114: How to be Creative. Episode #82: Interview Pet Peeves with Tara Lapointe. And, just for fun, we also found out which episode had the least downloads – the Christmas list. I guess we need to work on our Christmas to do list. We close up the episode with our favourite memories. Who remembers some of these moments? Clare gets caught in her car in a parking lot after dark while recording an episode. Julia feels like a celebrity when she found out that a professor made Young PR Pros a homework assignment. Kristine realizes how small the world is when a listener from India contacted the podcast for advice on being a communicator in her country. Kristine connected the listener to the local IABC chapter. Make sure you listen all the way to the end to hear about our biggest lessons learned. Even our hosts are learning every day and the podcast has brought forth some big lessons learned. We couldn’t have arrived here, where we are today, if it weren’t for each and every listener. Not only have you kept us alive by giving us an audience, but you have challenged us by asking important questions that needed answering for young professionals. Your inquisitiveness has helped thousands of young professionals across the world who feel the same doubt, uncertainty and curiosity as you do, get the answers they need. Keep sending in those questions! Special thanks to all our guest hosts over the years, for sitting down with Kristine, or any of our hosts, and letting us ask the easy and the hard questions. We wouldn’t be able to properly answer our listeners’ questions if it weren’t for you providing your wisdom and knowledge. Everyone here at Young PR Pros cannot wait to celebrate another 5 years on the airwaves. We can’t wait to answer more of your questions and dive deeper into the world of PR, communications and marketing. In an age of fake news and alternative facts, Young PR Pros feels it is our duty to help the next generation of PR pros learn about ethical communications, how to put strategy before tactics, and the importance of research to inform decisions. So thank you for listening and until next time! Don’t forget to share your opinions, favourite memories, or what is on your mind by writing a comment below, or on our Facebook Page, send us an email or audio note at youngprpros@gmail.com, or send us a message on Twitter @youngprpros. 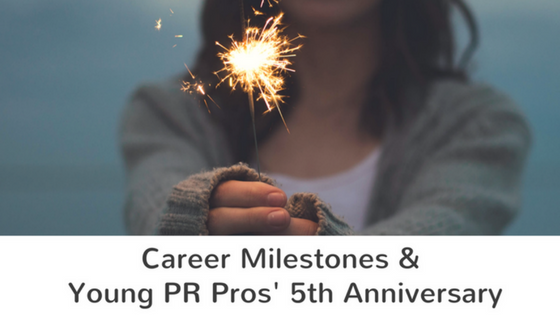 This entry was posted in Young PR Pros podcast and tagged anniversary, birthday, career, career advice, job, jobs, julia kent, kristine d'arbelles, professionals, ross simmonds, young pr pros, youngprpros by Kristine D'Arbelles. Bookmark the permalink.